Home » News » And Now We Wait: HBG Area Application in for Amazon’s HQ2. And Now We Wait: HBG Area Application in for Amazon’s HQ2. 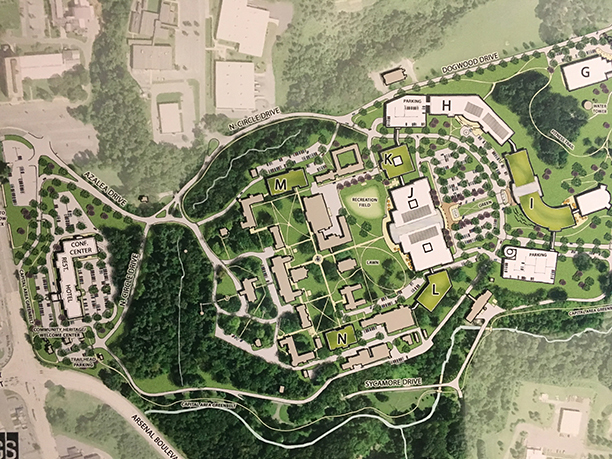 An artist’s rendering of Amazon.com buildings on the grounds of Harrisburg State Hospital. Harrisburg is officially in the running to be the next site of Amazon.com’s new corporate headquarters. The Harrisburg Regional Chamber of Commerce and CREDC held a press conference tonight to announce the details of the 140-page application they sent to Amazon executives earlier this week. 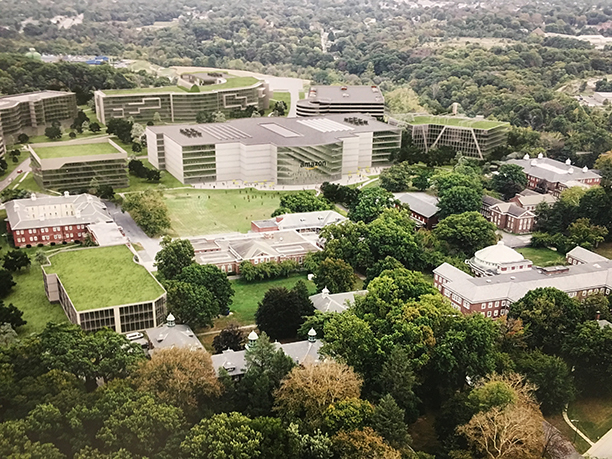 The application proposes a major renovation to the State Hospital Grounds in Susquehanna Township and extolls the quality of life, workforce and business climate of the south-central Pennsylvania area. The proposal focuses on Harrisburg but includes nine counties as part of the greater metro area, said chamber President David Black. 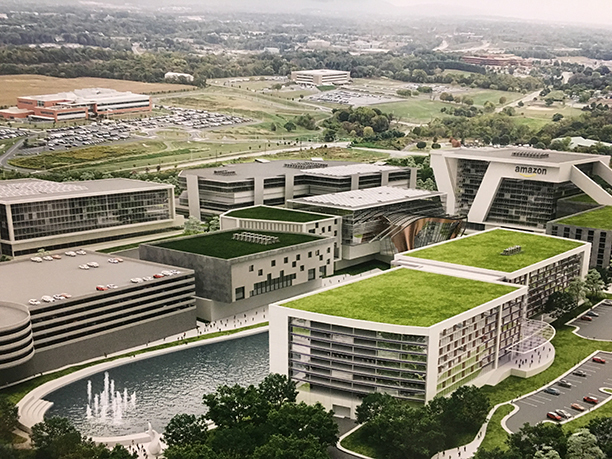 Black thinks that Harrisburg will stand out among the competition because it can offer a single property as the site of the headquarter campus. The application proposes constructing office towers up to 12-stories high at the State Hospital grounds. Last month, Amazon issued a request for proposals for its second corporate headquarters site, known as HQ2, which it says will bring upwards of 50,000 high-paying jobs and billions of dollars in investment to the city of its choice. In its request, Amazon also asked cities to identify incentives to offset building and long-term operating costs. Black declined to comment on the details of Harrisburg’s incentives package, but insisted that it would be “competitive” with what other municipalities are offering. He said it is too soon in the application process to offer specific incentives, such as tax breaks or credits. “The goal is to get them here and then go into detail with individual townships,” Black said. Developing tax incentives across a wide swath of land in Pennsylvania requires the approval of many different taxing bodies, including county commissioners, city councils and school boards. Black said that the chamber did not hold any public meetings with taxpayers or taxing agencies while developing the proposal. Black added that the chamber does not plan on making the proposal public, since Harrisburg is in competition with other cities. He did say that it was shared with members of the state Department of Community and Economic Development. Black spoke to some of the criteria that Amazon listed in its request for proposals, including its requirement that the new headquarters be near leading research universities and an international airport. The application lists Penn State University as a regional asset, according to Black. He also expressed confidence that Harrisburg International Airport would add direct flights to the West Coast if Amazon expressed interest in the region. In all, regional leaders think that Harrisburg is a strong contender for the coveted project. 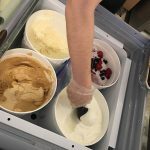 “We have everything people want right here,” said Jackie Parker, director of Harrisburg’s Department of Community and Economic Development. Amazon says it will review proposals this year and choose a city in 2018. “In a few months, I hope we’re all back here for a ribbon cutting,” said Dauphin County Commission Chairman Jeff Haste. A rendering of the overall campus site. Related: Burg Blog: You Might Also Like Harrisburg. Next Post Don't Dump Here: Harrisburg concludes city codes meetings.